An enthusiastic Fifth National Bioethics Conference recently concluded at St John’s Hospital, Bangalore. Most participants came away feeling energised; but unless that translates into concerted action to improve the public’s access to good healthcare, such gatherings would be futile. An editorial in this issue outlines the challenge of keeping the ethics movement going. 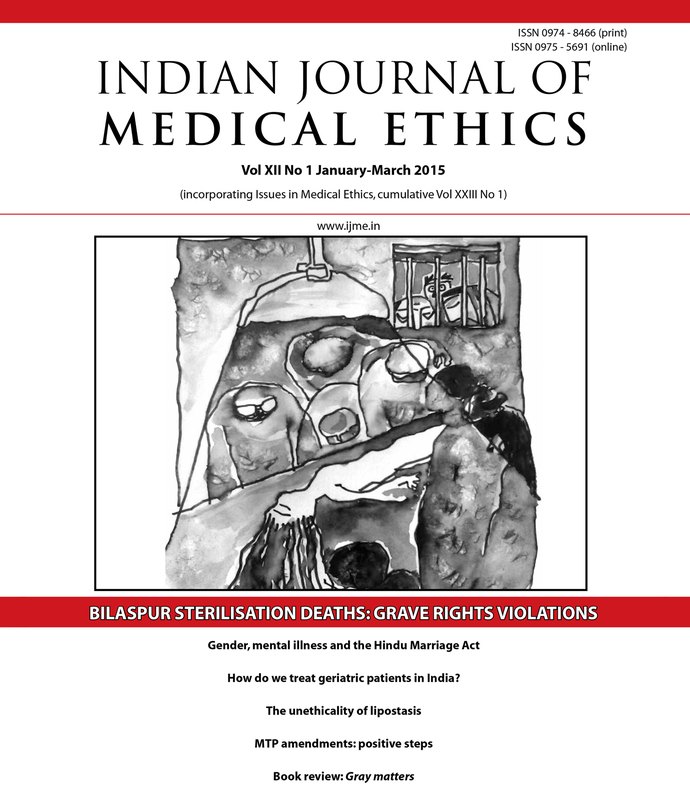 Another analyses the continuing distortions in state policy on women’s health and welfare as reflected in the indefensible deaths of 13 poor women in Bilaspur. How traditional caste oppression and inequities have been conveniently absorbed into modern Indian society is traced in one article; while varied manifestations of unequal treatment given to patients in the public health sector, the elderly , the mentally ill, extending even to the dead, are explored by other authors. The law pertaining to surrogacy and the draft amendments to the Medical Termination of Pregnancy Act are critically examined in two articles, while an author discusses the researchers’ obligation of disclosure of randomisation to patients and their families. IJME begins its 23rd year of continuous publication. This achievement would never have been possible without the participation and support of many. We mourned the passing of Dr Bashir Mamdani earlier, and now that of another stalwart, Dr Manu Kothari, who remained active to the very end. Cover credit: Original painting, courtesy of the artist, Mohan Des.